Known in Japan as Bishoujo Senshi Sailor Moon (and given the non-literal English title of Pretty Soldier Sailor Moon), Sailor Moon is a manga and anime series that fused the Sentai and Magical Girl genres. Created by pharmacist-turned-manga author Naoko Takeuchi, Sailor Moon lasted for five seasons (directed first by Junichi Sato then Kunihiko Ikuhara, two of the Names to Know in Anime), three motion pictures, and a number of TV specials, becoming its own cottage industry in the process. Sailor Moon is the story of Usagi Tsukino ("Serena" in the North American dub), a clumsy, lazy, underachieving 14-year-old crybaby schoolgirl whose life is completely changed when she meets a talking cat. The cat, Luna, tells her that she is a predestined magical warrior who must find the reincarnated princess of a lost kingdom of magic while, at the same time, defending Earth against the forces of the extra-dimensional evil responsible for the fall of said kingdom. In the course of a year, Usagi discovers other reincarnated warriors, learns how to be a leader, and discovers a secret power within herself that puts the combined force of the other Sailor Senshi to shame. In the end, she must find the courage to confront the evil mastermind behind the Dark Kingdom, sacrificing everything in her attempt to destroy it forever. Subsequent seasons go through a similar pattern with the strength of each set of foes escalating. The show was licensed overseas throughout a good portion of The Nineties, with pretty much every country/region getting their own international dubs which thoroughly displaced the original work (itself heavily displacing the original manga it was adapted from). Naturally, the regulation of translation accuracy, adaptation for ease of viewing, and editing due to local censorship concerns varied wildly by region. Coupled with the blooming internet, this allowed to fans to actually be aware of these changes (loudly, in the case of the North American fandom) sometimes even before they aired. Uncensored and censored versions of most of the series were eventually offered by Geneon and even ADV Films. All of these sets, as well as the uncut DVD releases for the three films (also released by Geneon), are now out of print. For various marketing reasons, the last season was never offically sold. Around 2003, Toei quietly pulled all licenses to the franchise worldwide, so non-bootlegged DVDs now go for a great deal of money online. This later changed; Toei shopped the show (in its entirety) around again, some countries have begun rebroadcasting the series, and Viz picked up the home video rights in North America. The original manga was one of the earliest series Tokyo Pop picked up (back when they were Mixx Comics), but all of their releases went out of print in 2005. Kodansha began to re-release the manga in English in September 2011, basing the new releases on the 2003 Japanese reprints. A live-action version of the franchise appeared on Japanese television between October 2003 and October 2004. Forty-nine episodes were broadcast of Pretty Guardian Sailor Moon, which established itself as a completely separate continuity, a Broad Strokes adaptation of the first Big Bad's arc leaning more heavily towards the original comic book. 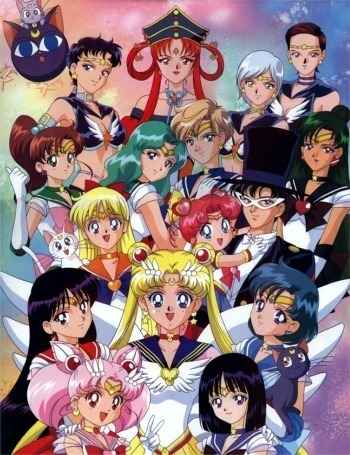 In July 2014, a reboot of the anime entitled Pretty Guardian Sailor Moon: Crystal premiered both in Japan and internationally; it can be viewed on Hulu. The manga has a Prequel to Sailor Moon, which is Codename: Sailor V (it's a prequel of sorts, anyway; the first issue was released before Sailor Moon, but the series itself was finished afterwards). There is also a set of stage musicals known as Sera Myu, an apocryphal Super Famicom RPG titled Sailor Moon: Another Story, and various other video game releases. There was also an aborted American live action/animation blend adaption by a company called Toon Makers which was pitched to Toei instead of the dub but it didn't get picked up and the only footage ever released to the public is a two minute music video that was put together using the pilot they produced. This adaptation was going to be rather...different, shall we say, and more information on that can be found at Toon Makers Sailor Moon. There is a character sheet for more details. Please put character-specific tropes there instead of adding them here. Do not mention the live-action version, the reboot, the musical, or the video game here. Put tropes relating to those specific entries on the appropriate pages. This page was last edited on 11 February 2019, at 04:13.